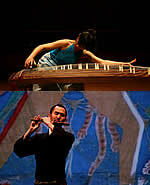 Ms Yumi Kurosawa (21-string Koto) and Mr. Kaoru Watababe (Japanese flute and Taiko drum) will visit four countries to give performances and workshops to local music students and general public audiences. Click here for more about Ms Yumi Kurosawa and Mr. Kaoru Watanabe. This program is co-organized with Embassy of Japan in Costa Rica, Honduras, Trinidad and Tobago and Panama.